Attraction marketing for network marketers (using the Internet) has been prolifically used and accepted for many years now. Yet there are still some very reluctant network marketers who refuse to grow as competent marketers, and rather exclusively build offline without the Internet. Attraction marketing for network marketers, as I will point out here in this post, will actually bolster one’s offline marketing efforts. If you’re not taking advantage of the internet right now – or more importantly, if you’re not educating your audience – you’re losing customers, prospects and existing downline members to those who are (whether you or your upline realizes it or not). Say you’re making your routine 50 dials a day to your batched opportunity leads. Or better yet, you’re making your “three new contacts” a day while going about work and errands. And you just so happen to hit on someone who’s at the right point in their life where they’re legitimately looking for an opportunity and you caught them at just the right moment in their day where they’re willing to take the time to listen to you. And say you actually manage to pique their curiosity enough to the point where they’re interested in finding out more. Or you direct them to your beautiful company website which is all about… you guessed it. Your one-of-a-kind opportunity. In the meantime, they’re (your prospect) doing their own research online about your opportunity… network marketing… working from home… and in the process they come across someone who is offering a free report about why most people don’t make money with their home based business or maybe a free video series about how to generate customers for free using the internet instead of talking to their friends and coworkers (which doesn’t appeal to them very much). 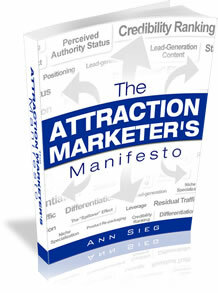 Like what I offer with the Attraction Marketers Manifesto. So they give their name and email address in exchange for the information and most likely, forget all about their appointment with you. They start receiving more of this person’s emails offering useful information…they see them as a helpful guide, a friend, someone who’s looking out for their best interests… trust is built… until eventually they ask that person how they can do what they’re doing. If you’re a network marketer and not using attraction marketing then the internet might be your worst enemy. It’s not really fair, but the people who are still doing the grunt work of one-to-one prospecting are fueling the downlines and customers lists of those who are positioning themselves as a valuable resource using the internet. At the very least, you need to be online if for no other reason than to protect your offline prospecting efforts. As millions of current MLMers, former MLMers, and people who have been prospected by MLMers are being driven online, everyday people who are implementing even the simplest attraction marketing techniques can’t help but scoop them up. Attraction marketing for network marketers is here to stay. It’s growing and growing because the Internet isn’t going away. If you’re involved with network marketing, here is a great way to get started with attraction marketing … and it won’t cost you a thing. to get started with Attraction Marketing today. i read your manifesto a few days ago and it really blew my mind. Now all I have to do is find my niche (which i probably already know at the back of my mind – i just need to find out what it is). Thank you so so much. Really appreciate what you’ve done.